Hey everybody, Truffles at the keyboard! I am purring with excitement today because I'm interviewing the kitty of a literary legend, Edgar Allan Poe's beloved Cattarina, now the star of her very own mystery series! As you can guess, with both of us being torties we had a lot to chat about so I want to get right to it, but make sure you check out Mommy's review of The Tell-Tail Heart and enter to win an ebook copy of your very own! Welcome, Cattarina! I am so honored that you took time from your busy schedule to visit my blog. Your owner Eddie is a very famous man. Can you tell us about him? Thank you, Truffles, for the opportunity to talk about my Eddie. He is a man of letters, which means he spends most of the day scribbling them with a quill pen. When his feather dances across the page, he is the most charming of companions—a delight! But when his feather scratches in fits and starts, my friend retreats into a black despair. It is during these times that his occupation turns into an unhealthy preoccupation, and I must lift him from it. How did you come to live with him? We met each other by the docks of the Schuylkill River. At the time, I was living in an empty pickle barrel with my Auntie Sass—I still cannot stomach the smell of vinegar-and had grown rather weary of street living. When I happened across Eddie near the water’s edge, he had the most plaintive look on his face, as if the world no longer met his expectation. At that point, I knew he needed me more than Auntie Sass did. You have a very special relationship with Eddie's wife Sissy as well. You take such good care of her! What is her story? Eddie is my one and only, and no one will ever take his place. But if someone were to, it would be Sissy, the dear girl. She may be fragile of body, but her spirit is strong, and I respect that. Unfortunately, her consumptive cough grows worse each day, and there is little I can do beyond keeping her warm at night. While we cats do not fret the future, the certainty of her death weighs heavily on my thoughts at times. Mommy and I just loved your first adventure, The Tell-Tail Heart. Could you tell us a little about the story and how you came to be a feline detective? I am what you would call an “accidental detective.” I began my escapade as a way to lift Eddie’s mood. But in the course of my investigations, I found I rather liked running about in search of a madman. I tell you, Truffles, the pounds and years melted right off. And if I may be candid, tracking human quarry put my hunting skills to the test. Had I not caught the Glass Eye Killer, he may have gone on to rob all the glass eyes in Philadelphia! In the end, I inspired Eddie to finish a story of a similar title. What is a typical day like for you? Do you have any time for regular kitty stuff? As Eddie’s muse and all-around assistant, I attend to a great many things while he works. If the window is open, I serve as paperweight. If his quill pen lingers too long in one spot, I bat the end of it and get it moving again. I’ve even been known to decorate his pages with my own inky paw prints. Yet, I save time for catterly pleasures, ribbon chasing and sun-napping and the like. I’ve even begun an insect collection. Just this morning, I added a grasshopper to the assortment, stuffing it between the couch cushions to play with later. I am certain Sissy will never find it. We're both torties!!! Aren't torties the greatest? How do you display your tortitude? As you know, Truffles, torties are superior. It is our birthright. We are the linchpins of our households and the center of feline gatherings. As I’m sure you’ll attest, we communicate what we want to our companions, and if we don’t get it, we find a way to secure it. I, myself, am a master lock-picker and acrobat extraordinaire, two skills that aided me greatly in The Tell-Tail Heart. My ability to escape trouble is surpassed only by my ability to get into it! Your name is so beautiful! Does it have any special meaning? Beyond the obvious pun, it holds no special meaning, save for the fact that Eddie gave it to me. Yet it has a lyrical quality only a writer could bestow. Alas, the cloud of despair casts itself over the Poe household again, calling me to duty in The Black Cats. It’s a mystery that involves not only human murder, but feline murder as well, and has more surprises than a Dickens novel. An old character from The Tell-Tail Heart plays a key role, but I also meet new friends who help me avenge the death of a fellow cat. I am nothing, if not loyal, to my kind. Blurb: The untold story behind Edgar Allan Poe's "The Tell-Tale Heart." Philadelphia, 1842: Poe’s cat, Cattarina, becomes embroiled in a killer’s affairs when she finds a clue to the crime: a glass eye. It’s only when her beloved “Eddie” takes an interest, however, that she decides to hunt down the madman. Her dangerous expedition takes her from creepy Eastern State Penitentiary to Rittenhouse Square where she runs into a gang of feral cats intent on stopping her. But new problems arise faster than she can solve them. As the mystery pulls Cattarina deeper into trouble, even Eddie becomes the target of suspicion. Yet she cannot give up the chase. Both her reputation as a huntress and her friend’s happiness are at stake. For if she succeeds in catching the Glass Eye Killer, the missing pieces of Eddie’s unfinished story will fall into place, and the Poe household will once again experience peace. At the story’s pulse-pounding conclusion, Poe gets the inspiration he needs from his feline muse, enough to finish "The Tell-Tale Heart." Full of Victorian witticisms and rich, historical detail, this cozy cat mystery is a fictional account of Edgar Allan Poe’s real-life animal companion. Fans of historical and animal mysteries are sure to like this series. Mochas, Mysteries and Meows Review: When is the last time you read a fantastic historical mystery told from a cat's point of view? I would guess never. When I first adopted Tara back in 2007 I did a lot of research on tortoiseshell cats, and one of the most fascinating things I discovered is that Edgar Allan Poe was owned by a tortie named Cattarina. Imagine my absolute delight when I stumbled upon this little gem during a recent scour of new cozy titles on Amazon. I have long been a huge fan of Poe, and one of my cherished possessions is an old cassette tape narration of "The Tell-Tale Heart." This story is a fictionalized behind-the-scenes look at how Poe's furry muse helped him to finish writing his masterpiece. It is truly one of the most unique and creative mysteries I have read in a long time. Cats are mysterious by nature, and anyone who has ever been owned by a tortie will find Cattarina's tortitude to be spot on, making this a must read for any aficionado of cat cozies. Giveaway: Leave a comment by noon eastern on May 5th for the chance to win an ebook copy of The Tell-Tail Heart. Don't forget your email address! I don't tweet, so this rafflecopter excludes me, sadly. Absolutely fascinating and a girl after my own heart. I also write a cat mystery partly written from the cat's POV, Black Cat's Legacy. I'd love to receive a copy of your book. What a great concept. In high school Mommy got to go to a dramatic reading of A Tell Tail (oops, Tale) Heart which she said was awesome. And Mommy was literature major in college. She loves reading, and also reading to me, her sweet kitty with catitude. Please may I win this for her for a Mommy Day present? A super fun interview. This cat is one-of-a-kind: 3 cheers for Cattarina! Truffles, you always do such a good interview---I can hardly wait to read about Cattarina. Great interview! 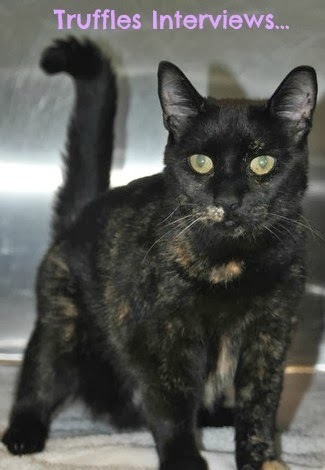 We think that is so neat that Edgar Allen Poe had a tortie!